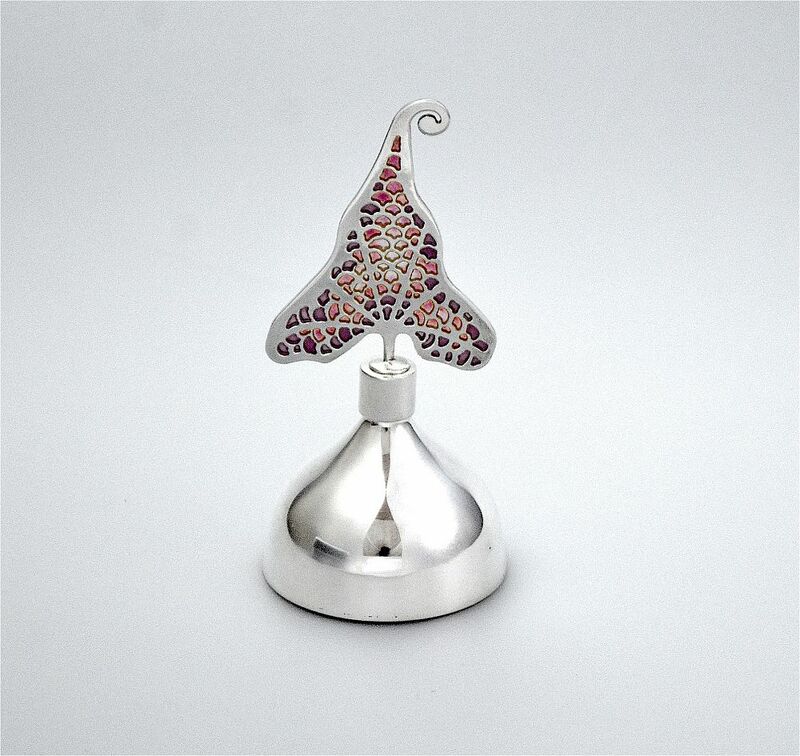 This lovely small silver scent bottle has a silver domed base and a flat leaf shaped silver and plique a jour stopper, the plique being in shades of purple and pink. The base is hallmarked by the London Assay Office for silver, 2009 and bears Jean's sponsor's mark - "JW". Born in the Republic of Ireland, Jean knew from an early age that she wanted to be a silversmith but she was not able to begin to realise those dreams until her thirties after a successful career in I.T. designing and programming computer systems. Fittingly it was this career that enabled her to finance her silversmith training. She trained under Brain Clarke, Michael Good, Lori Talcott, Eva Hofelmaier and Phil Barnes. Jean is inspired by nature, its colours shapes textures & spaces, by the work of the Art Nouveau enameller Eugene Feuillatre and most lately by the mentoring and teaching of Master Enameller Phil Barnes who Jean credits with bringing her to where she is today: an award winning silversmith jeweller & enameller and the only person in this county working with plique a jour done in this method on large pieces. Jean has won awards at the Goldsmiths Craft & Design Awards in the Enamellers Senior section in 2011, 2014 & 2016. She has participated in a number of exhibitions and in 2013 gave the Master Class on plique a jour enamelling at the Guild of Enamellers 2013 annual conference held at Queen Ethelburga’s College York. Jean is a member of the British Society of Enamellers and the Guild of Enamellers. Plique a jour ("glimpse of day",) is a type of enamel which creates the translucent effect of a stained glass window. There are two methods. The first is where the enamel is put into “cells” made of metal usually silver or gold that have no backing. These are then fired at very high temperatures. A number of firings can be done. This method was used by Lalique & Feuillatre and is used by Jean Wilkinson. The second method is the etched method as used by Thesmar. A copper form has wires laid on it, much like cloisonné, the enamel is then applied to this backing and fired onto it. The copper is then etched off with acid. The appearance of this type of plique a jour is different.